The 6th Government Law College International Law Summit, organized by the Students for the Promotion of International Law (SPIL), Government Law College, Mumbai. The Summit is scheduled to take place from the 30th January- 1st February, 2015. The theme for the Summit, 2015, is International Economic Law and Policy. Government Law College enjoys the distinction of being the oldest law school in Asia and has, since its inception in 1855, essayed a seminal role in the evolution of the legal and judicial landscape of India. Generations of legal luminaries, nurtured at Government Law College, have made remarkable contributions to the evolution of Indian jurisprudence. Taking cognizance of the immense relevance of growing transnational interactions, SPIL, Mumbai has undertaken the task of promoting international law and facilitating an empirical study, which rises beyond the realm of mere textual knowledge. 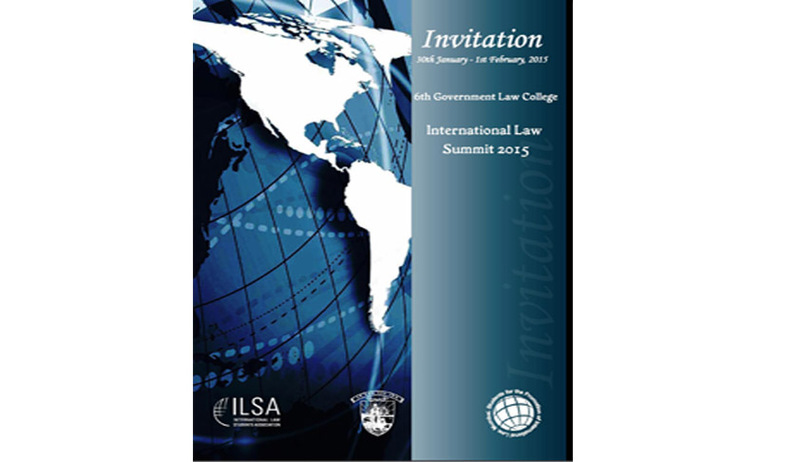 The Government Law College International Law Summit is a result of this constant endeavour. The Summit comprises, aside from the key note addresses, lectures, workshops and call for papers, two novel competitions – Judgment Deliberation Competition and Treaty Appreciation Competition, which were conceived within the portals of our hallowed institution, Government Law College. Our associations with premier institutions such as the International Law Student Association, Chicago and the Indian Society of International Law, New Delhi have only added to our credentials, and have ensured interest and participation from reputed law schools across the world. Also attached is the Invitation to the 6th Government Law College International Law Summit, 2015, comprising of the competition modules. Please note - The last date of registration for the Judgment Deliberation Competition and Treaty Appreciation Competition has been extended till 30th November, 2014. The date of submission of the judgment and critique for the respective competitions has been extended till 30th December, 2014. SPIL and Government Law College, Mumbai look forward to hosting students from University of Mauritius and will cherish the opportunity to engage with like-minded individuals, as we celebrate the joyous exploration of the many nuances of International Economic Law.